The Clear Fork High School band performed patriotic music before and during the ceremony. Residents braved the heat for the ceremony July 2. 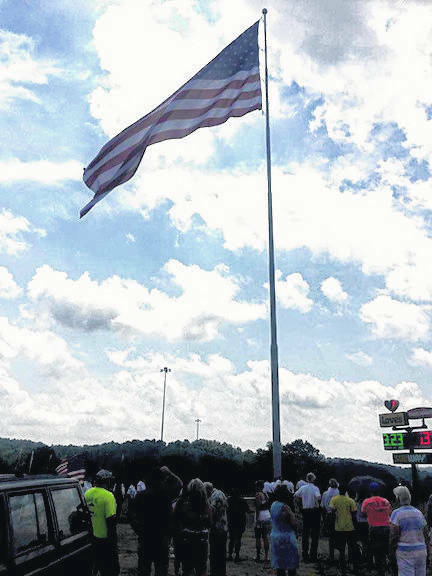 Residents watch a large American flag being raised July 2 behind Love’s Travel Stops. BELLVILLE — American enterprise and patriotism came together here on a hot Monday afternoon, with a healthy dose of volunteerism sprinkled in. A 30-foot by 60-foot American flag went up on property behind Love’s Travel Stops — just in time for the Fourth of July. “This is our Bellville monster flag pole,” village mayor Teri Brenkus told a group of several hundred gathered in near 90-degree heat overlooking Interstate 71 and State Route 97. The pole stands 120 feet high. Love’s paid for it, lights and electricity. Everything else came via contractors’ generous donations. “The pole cost $20,000 and they dug a hole 14-feet deep. It weighs 7,800 pounds,” Brenkus said. She got the idea for a large flag after a family vacation to Texas one year ago. She approached Tom and Judy Love and American Legion Post 535. From there volunteers came forward to help. “I knew this was the ideal location. But I didn’t do this by myself,” Brenkus said as more than a dozen people who assisted stood behind her at the makeshift podium. Liberty Lawn Care will landscape the area around the flagpole. The project was originally scheduled to be done on Memorial Day, but delays occurred. Village and Richland County officials, Chamber of Commerce representatives and area residents attended the flag raising. 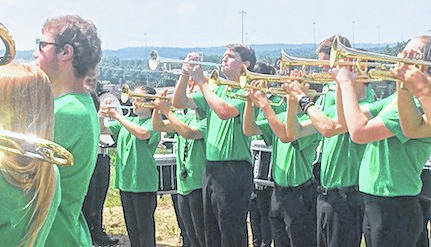 The Clear Fork High School band played patriotic music as residents stood under umbrellas and small tents to ward off the heat. Love’s Travel Stops, headquartered in Oklahoma City, opened this location last December. Travelers stop for gasoline and food at the store, two restaurants and more. Residents Joann and Ken Johnson were among the crowd. “We’re proud of what’s been going on in town with the mayor, and to do this project without using any public money,” Joann said. “It’s a tribute to small-town America,” Ken added. https://www.morrowcountysentinel.com/wp-content/uploads/sites/29/2018/07/web1_cfband-1.jpgThe Clear Fork High School band performed patriotic music before and during the ceremony. 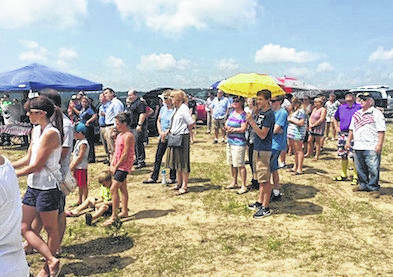 https://www.morrowcountysentinel.com/wp-content/uploads/sites/29/2018/07/web1_crowd-1.jpgResidents braved the heat for the ceremony July 2.
https://www.morrowcountysentinel.com/wp-content/uploads/sites/29/2018/07/web1_flag-1.jpgResidents watch a large American flag being raised July 2 behind Love’s Travel Stops.